A regular breeding resident, and migrant, the Tree Swallow was abundant during the Minnesota Breeding Bird Atlas (MNBBA). The Tree Swallow is widely distributed and common to abundant across the United States and Canada. It is uncommon or absent from many parts of the southern United States and beyond the tree limit of northern Canada (Figure 1). Among the highest densities observed in North America are those in central and southwestern Minnesota and east-central Wisconsin. Short-distance to long-distance migrant that over-winters in the southern United States, Mexico, through Central America, and the Caribbean. Flying insects; rarely fruit except during inclement weather and in winter. Secondary cavity nester in trees, nest boxes, and occasionally holes in a variety of unusual locations. Breeding distribution and relative abundance of the Tree Swallow in North America based on the federal Breeding Bird Survey from 2011 to 2015 (Sauer et al. 2017). Nests have been found throughout the state, but Roberts (1932) stated the species was found less commonly in the prairie region, where he suggested it is replaced by the Barn Swallow. He emphasized that where there is a nest site, “there must be water not far away.” He reported confirmed nests over widely scattered portions of the state from Goodhue County in the southeast; Lake County in the northeast; McLeod, Grant, and Otter Tail Counties in the west; and Lake of the Woods County in the north. His confirmed nesting observations illustrated the Tree Swallow’s widespread distribution in the state. Many years later, Green and Janssen (1975) simply stated it is a resident “throughout the state” and “numerous in all regions.” They did not provide a map of confirmed nesting in the state. Several years later, however, Janssen (1987) presented a map of confirmed nesting activity that included 49 counties in Minnesota since 1970. Hertzel and Janssen (1998) expanded the confirmed county nesting records since 1970 even further to 60 of the 87 counties in Minnesota. Given the high densities reported by the federal Breeding Bird Survey (BBS) (Figure 1), many counties in which confirmed nesting was not reported by Janssen (1987) or Hertzel and Janssen (1998) is noteworthy. The areas lacking confirmed nesting were primarily in the agricultural regions such as the southernmost two tiers of counties and counties in west-central Minnesota. The Minnesota Biological Survey (Minnesota Department of Natural Resources 2017) included 1,242 breeding season locations from counties where they have completed inventories. Breeding observations were limited to one location in Chisago, Goodhue, Olmsted, Rice, and Sibley Counties. However, many of the counties without confirmed nesting activity identified by both Janssen (1987) and Hertzel and Janssen (1998) since 1970 had multiple breeding observation locations, such as in southern and west-central Minnesota. The MNBBA included 4,820 records with confirmed nesting in every county and illustrating the Tree Swallow as one of the most widely distributed species in Minnesota (Figure 2). It was recorded as potentially nesting in 53.2% (2,541/4,779) of the blocks and confirmed nesting in 21.6% of those blocks (Figure 3; Table 1). The MNBBA documented extensive breeding activity throughout much of southern Minnesota and especially in the central and west-central regions of the state. Breeding records were less numerous in the northeastern forested regions because the species avoids dense forested areas. The MNBBA probability modeling supported these observations with highest densities predicted in the transition region between the forested areas of the northeast and the agricultural, open landscapes of the western and southern regions (Figure 4). Higher densities were also predicted along many of the large river floodplains such as the Minnesota and Mississippi Rivers. Less suitable habitats were predicted to be in the heavily forested regions in the northeast and north-central regions of the state. The distribution of the Tree Swallow has likely not changed substantially from the past in Minnesota. Intensive agriculture and urbanization that has resulted in a landscape devoid of suitable nest sites, whether it be trees or nest boxes, have likely reduced local distributions and overall populations in the state. The placement and maintenance of nest boxes for the Eastern Bluebird have aided successful nesting for the Tree Swallow in otherwise unsuitable habitats. Because of the lack of detailed distributional data in Minnesota from the late 1800s and early 1900s, it is impossible to decipher specific population changes. Winkler et al. (2011) in their review of the Tree Swallow in North America stated it was uncommon south of Maryland before the 1920s but now is a regular nesting species southward into South Carolina and Georgia, and westward to Texas and Oklahoma. They further commented that expansion is continuing likely due to land clearing, reintroduction of beaver, expansion of its diet, colonization of bluebird houses, and damming of streams. Breeding distribution of the Tree Swallow in Minnesota based on the Breeding Bird Atlas (2009 – 2013). Summary statistics of observations by breeding status category for the Tree Swallow in Minnesota based on all blocks (each 5 km x 5 km) surveyed during the Breeding Bird Atlas (2009-2013). Summary statistics for the Tree Swallow observations by breeding status category for all blocks and priority blocks (each 5 km x 5 km) surveyed during the Minnesota Breeding Bird Atlas (2009-2013). Predicted breeding distribution (birds detected per 10-minute point count) of the Tree Swallow in Minnesota based on habitat, landscape context, and climate data gathered during the Minnesota Breeding Bird Atlas (2009-2013) using the General Linear Modeling method without an adjustment for detectability. Tree Swallows are widely found in open areas with suitable nesting trees or nest boxes, and commonly near water (Niemi and Pfannmuller 1979; Mengelkoch et al. 2004; Winkler et al. 2011) (Figure 5). These areas include meadows, agricultural fields, pastures, wetlands, suburban areas, shorelines, and recently logged areas (Niemi and Hanowski 1984; Niemi et al. 2016). The MNBBA primarily observed the Tree Swallow in sparsely populated developed areas but also frequently in open grassy areas in the north, in cropland, wet marshy areas, and in oak forests that tend to have lower densities of trees (Figure 6). The species may be limited by the availability of suitable nest sites such as those excavated by Northern Flicker, Yellow-bellied Sapsucker, Hairy Woodpecker, and Downy Woodpecker. However, the Tree Swallow is known to also use cavities in a variety of locations, such as in broken tree limbs, hollow stumps, and cracks in rocks (Winkler et al. 2011). Typical breeding habitat of the Tree Swallow (© Gerald J. Niemi). Habitat profile for the Tree Swallow based on habitats within 200 m of point counts where the species was present during the Minnesota Breeding Bird Atlas (2009-2013). Partners in Flight (PIF) (Rosenberg et al. 2016) estimated the North American breeding population as 20 million adults. The MNBBA did not estimate a breeding population, primarily because of the roadside bias in counting the birds where they are often found, near nest boxes, on fence lines, and on telephone and power lines. The BBS in Minnesota indicated a stable population from 1967 to 2015, although the trend hints at an overall increasing population (Figure 7). Detection of the species has high variability, which contributes to the trend data’s lack of significance. However, over the same period the species has been significantly declining survey-wide (-1.38% per year), in Canada (-2.25), in the boreal-hardwood transition region (-4.09), in Ontario, (-3.65), and in Michigan (-1.21). According to the BBS, populations have also been stable in Wisconsin but are significantly increasing in North Dakota (5.82%). The greatest declines appear to be in the northeastern United States, eastern and central Canada, British Columbia, western Oregon and Washington, northern Utah, and southwestern Colorado. Substantial declines are also detected in northern and northeastern Minnesota as well as in the Twin Cities metropolitan area (Figure 8). Populations have been increasing in selected portions of western, central and southern Minnesota. PIF (Rosenberg et al. 2016) estimated that overall the population declined by 40% from 1970 to 2014. There are few population estimates within specific habitats. Winkler et al. (2011) summarized that densities were highest in Canada, New England, and the Great Lakes region, where 3 to 30 adults are counted on BBS routes (Figure 1). Densities decline as one moves southward into central portions of the continent. The National Forest Bird Monitoring Program (Niemi et al. 2016) found higher mean densities in the Chippewa National Forest with 0.05 per 40 ha compared with only 0.01 per 40 ha in the Superior National Forest. Still, these are both relatively low overall counts, and they reflect the lower population levels of this species in heavily forested regions. 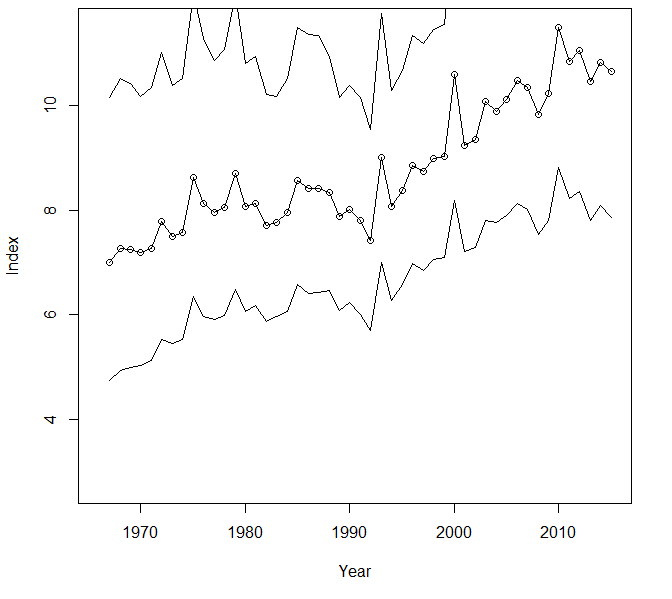 Breeding population trend for the Tree Swallow in Minnesota for 1967–2015 based on the federal Breeding Bird Survey (Sauer et al 2017). Breeding population trend map for the Tree Swallow in North America for 1966 to 2015 based on the federal Breeding Bird Survey (Sauer et al. 2017). The Conservation Concern Score for the Tree Swallow is 10 of 20, or of moderate concern (Rosenberg et al. 2016). The Tree Swallow is still a common bird, but population declines are a concern in many parts of North America. The species’ overall estimated population decline of 40% over the past 40 years supports this concern. The Tree Swallow nests close to water and consumes insects emerging from the sediment of water bodies, many of which are contaminated. Several studies have documented the cocktail of contaminant compounds that both adults and young are exposed to from these sediments (Ankley et al. 1992; Jones et al. 1993; Nichols et al. 1995). Winkler et al. (2011) reviewed the plethora of studies that have been completed on this species, and the Tree Swallow has been increasingly used to model uptake of aquatic sediment contamination and pathways to terrestrial wildlife. The overall effects of these contaminants on wildlife are not completely known, but Heinz et al. (2009) clearly showed that methylmercury has adverse effects. The Tree Swallow, like many aerial insectivores, has declining populations in North America (Nebel et al. 2010). In addition to potential contaminants, loss of aquatic habitats has played a role in local and regional population declines. Problems include reduced food supplies and loss of available nesting trees (Hobson and Schieck 1999). Natural disturbance regimes such as fire, wind, and insect outbreaks leave many available nesting substrates with suitable cavities, whereas clear-cut forests provide limited opportunities. In Minnesota, however, harvesting guidelines encourage 6–12 trees per acre be left within a logging site (Minnesota Forest Resources Council 2005). Cadman et al. (2007) emphasized that recent declines are likely related to “phenomena affecting their common food source or breeding habitat, such as the intensification of agricultural practices, grassland conversions, and decreases in insect populations.” They also suggested that inclement weather events in spring may negatively impact population levels. Langham et al. (2015) and the National Audubon Society (2015) in their review of bird species’ susceptibility to climate change indicated the Tree Swallow was “climate threatened.” They suggested it will have a 56% loss of its current winter range by 2080 but will benefit to some extent with some expansion in its winter range. They also suggested a 61% loss of its current breeding range, which will move northward in the future. Changes due to climate were already reported by Dunn and Winkler (1999). They found the species’ average laying date was 9 days earlier in North America from 1959 to 1981 due to higher spring temperatures. Many factors have negatively affected the ecology of the Tree Swallow over the past 150-plus years, such as habitat loss and changes, exposure to contaminants, changes in food supplies, and most recently warmer temperatures with more variable weather conditions. The overall future of this species is difficult to predict. Ankley, Gerald T., Keith Lodge, Daniel J. Call, Mary D. Balcer, Larry T. Brooke, Phillip M. Cook, Russell G. Kreis Jr., Anthony R. Carlson, Rodney D. Johnson, Gerald J. Niemi, Robert A. Hoke, Corlis W. West, John P. Giesy, Paul D. Jones, and Zhang C. Fuying. 1992. “Integrated Assessment of Contaminated Sediments in the Lower Fox River and Green Bay, Wisconsin.” Ecotoxicology and Environmental Safety 23: 46–63. Dunn, Peter O., and David W. Winkler. 1999. “Climate Change has Affected the Breeding Date of Tree Swallows Throughout North America.” Proceedings of the Royal Society of London, Series B: Biological Sciences 266: 2487–2490. Heinz, Gary H., David J. Hoffman, Jon D. Klimstra, Katherine R. Stebbins, Shannon L. Kondrad, and Carol A. Erwin. 2009. “Species Differences in the Sensitivity of Avian Embryos to Methylmercury.” Archives of Environmental Contamination and Toxicology 56: 129–138. Hobson, Keith A., and Jim Schieck. 1999. “Changes in Bird Communities in Boreal Mixedwood Forest: Harvest and Wildfire Effects Over 30 Years.” Ecological Applications 9: 849–863. Jones, Paul D., John P. Giesy, John L. Newsted, David A. Verbrugge, Donald L. Beaver, Gerald T. Ankley, Donald E. Tillitt, Keith B. Lodge, and Gerald J. Niemi. 1993. “2,3,7,8-Tetrachlorodibenzo-p-dioxin Equivalents in Tissues of Birds at Green Bay, Wisconsin, USA.” Archives of Environmental Contamination and Toxicology 24: 345–354. Mengelkoch, Jean M., Gerald J. Niemi, and Ronald R. Regal. 2004. “Diet of the Nestling Tree Swallow.” Condor 106: 423–429. Nichols, John W., Christen P. Larsen, Michael E. McDonald, Gerald J. Niemi, and Gerald T. Ankley. 1995. “A Bioenergetics-Based Model for Accumulation of Polychlorinated Biphenyls by Nestling Tree Swallows, Tachycineta bicolor.” Environmental Science and Technology 29: 604–612.